JESSE HART TALKS MIKE JIMENEZ CLASH: "NOW IS THE TIME TO SEPARATE THE GOOD FROM THE GREAT...SOMEBODY'S 0 HAS TO GO"
"We not dealing with a guy that got knocked out or a guy that lost. We dealing with a 16-0 guy like myself. He is a live guy and anytime you got that, it's about who's making adjustments; subtle adjustments. I think now is the time to separate the good from the great. He's a good fighter. I'm a great fighter...Somebody's 0 has to go and I want everybody to know that Jesse Hart is the next superstar to transcend the sport and make a household name for myself...I will be at a high level and my boxing IQ is going to be on point. I will fight smart and I think that's what's going to set up the knockout," stated undefeated super middleweight contender Jesse Hart, who talked abou this upcoming clash with fellow undefeated contender Mike Jimenez on the May 2 undercard of Mayweather vs. Pacquiao. Check it out! PC: You finally have an opponent for your May 2nd date. How much do you know about Mike Jimenez? JH: I know he's a tough kid and he comes to fight and he will be looking for a victory, just like I'll be looking for a victory. 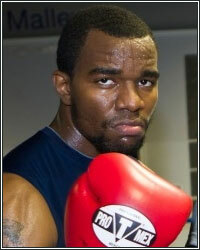 PC: You told me before that if Top Rank brings you a list of names, you ask for the toughest on the list. Jimenez is 16-0. Was that the case or was he the only name mentioned? JH: It was like before. I told them to bring me a tough opponent. It was a list of guys. They brought me a kid named Ivan Ayala and another kid, but like I said, those kids, I didn't feel no spark. For this fight, I needed that spark. That's what I was looking for and he gave me that spark. For this card, this is a very big card, so you want to get in there with a name or somebody with an 0 on their record so you can let the people know who you really are. PC: Have you been able to find footage of him? JH: I've seen some things on him on YouTube. I watched a couple of fights, but you know, when you get in there, everything is different. I know I'll have to adjust because you can't go by film. A guy may do something in one fight that he doesn't do against me. You gotta switch up. We dealing with a 16-0 guy here. We not dealing with a guy that got knocked out or a guy that lost. We dealing with a 16-0 guy like myself. He is a live guy and anytime you got that, it's about who's making adjustments; subtle adjustments. I think now is the time to separate the good from the great. He's a good fighter. I'm a great fighter. PC: The magnitude of this card may never be duplicated again. With that being said and you having the platform of this card, what type of statement are you looking to make on May 2nd? JH: I'm looking to separate myself by just fighting a guy that's 16-0 early in my career. Somebody's 0 has to go and I want everybody to know that Jesse Hart is the next superstar to transcend the sport and make a household name for myself. I didn't want people to say it was a fluke and that's why I picked this guy. I wanna perform at a level that no one has ever seen me perform at. I will be at a high level and my boxing IQ is going to be on point. I will fight smart and I think that's what's going to set up the knockout. PC: You pride yourself on being smarter than your opponents. Is that what you think will happen in this fight? Obviously both being undefeated, neither one of you will want to lose. Will ring IQ be the difference in your opinion? JH: Yes! I think that's what it all boils down to. Everybody works hard in the gym, everybody do road work, everybody hit the heavy bag and everybody...well, supposedly everybody lives clean. I know I live clean. I don't know if he drink or smoke, but little things like that always play a part. We're going to see who is really the better fighter. My boxing IQ will allow me to be on any mistake he makes as far as his feet, his hands dropping, or him just not being smart. If he's just coming in throwing punches and not thinking before he reacts, he's going to get knocked out. I don't move cautiously; that's just what it is. I think about it and I do it. You can see a fighter throwing punches versus a thinking fighter. You can see a difference. You can go back to the Ray Robinson tapes and watch him fight. You can see him thinking in there. That's what type of fighters that last long. The fighters that think in there. I get it. Any adjustments, I'm gonna be able to make as this fight is not going to go the distance. But the guy is a tough kid. We are fighting a 16-0 guy who has 10 knockouts. But whatever he has on May 2nd, it just won't be enough. It's just not gonna cut it this time. I'm very very hungry. I've been very hungry since I turned pro. Just by being on this card, I have to perform gracefully. I have to perform excellent and doing that, you have to train your mind, body, and soul and that's what I'm doing. Somebody's 0 gotta go and that's basically what it is. PC: I noticed you have been watching a lot of old school fights and fighters like Ray Robinson and Bob Foster. What are you taking away from those fights? JH: The smarts and the knowledge in the jab. I have a hell of a jab, but you gotta look at where Tommy Hearns learned where to jab from. He learned how to jab from Bob Foster. You gotta look at where Larry Holmes learned the jab from. He learned from Bob Foster as well. I see all of these guys and I'm like, "They got hell of a jabs." My dad was like, "You gotta look at who they learned it from," and I looked at it and I was like, "Wow, they really jab like Bob Foster!" It's like a whipping jab. It's like a whip. Ali used more of a float jab. He was moving when he jabbed. Bob Foster was more of a "Im'a stalk you with this jab." So that's a different type of thing. He stalked you with his jab and it was at an angle. Things like that, you gotta look at. That's why I pride myself on being a student of the game. I watch modern day fights, but I don't study them. I always study old school fighters. I want to see how all this stuff originated. And that's what I mean by saying having a boxing IQ. Anybody can just go in there and just throw punches, but is your mind sharp? PC: YouTube is a great tool for fighters these days my man. You really have to utilize it. JH: And I don't take that for granted, Perc. I really use YouTube. Old school fighters didn't have that. People really need to become students and not just say they box. Nah, I'm a student of this game and that's why I think I'm going to be a superstar. PC: I know you were training hard before you got an opponent, but does it automatically kick up a notch once you got a name? JH: Yes, it always does. When I knew the date though, I was already on go. I didn't care who they put in front of me because when I heard the date May 2nd, I knew that was history in itself. You are on the same card as Manny Pacquiao and Floyd Mayweather. When I go to BoxRec and I see that, that's just motivation in itself. When you see that on BoxRec, it's like, "Yo, I'm really on this thing." I go to the gym every day just off of motivation. It makes me work really hard. When you look at stuff like that, Perc, that'll motivate you alone. I didn't even need to know who the opponent was. And I'm fighting for 2 regional titles; USBA and NABO. They just recently added the NABO last night. God willing after this victory, I'm gonna be ranked by the IBF and the WBO. PC: I look forward to the fight. Of course we will be in contact leading up to the event. Is there anything else you want to add? JH: Tune in to ShoExtreme before the pay-per-view fight and watch me become a superstar and watch me catapult my career into superstardom. I know it's a big fight and everybody wants that, but after this fight, it's over. I'm gonna be the one to look at. I'm going to be on pay-per-view and I'm going to be the one to keep boxing going. I want to thank my promotional team: Top Rank and Bob Arum and his entire staff. And I gotta thank the best boxing website in the world, FightHype. Number one in the world. I love you guys!